This is a simple carrot dish with a natural, marvelous sweetness. You simply have to grate a carrot, wrap it in aluminum foil and cook it along with your rice in a rice cooker. In fact, I'm not sure if this can even be considered a "recipe" since you only have to prepare a carrot and rice! I have always found it difficult to make a nice carrot dish. I was skeptical, therefore, when Ranmarutei-no-okami emailed me this recipe, claiming it to be very sweet and tender. I decided to try it anyways and was richly rewarded. The carrot tastes very sweet without being heavy as the carrot glazes. And unlike boiling, this mode of cooking creates a very flavorful carrot. The cooking process is the crucial point in this recipe. Although it is possible to cook the foil-wrapped carrots in boiling water only, I believe that the results would be different. The heat interaction between the foil, rice and hot water is different from that of foil and hot water only. The rice may also activate the flavor of this dish. If you use an organic carrot, it does not need to be grated. Otherwise, grate your carrot and wrap it tightly in aluminum foil, as in the photo illustration. Make sure that there are no air pockets between the carrot and foil. 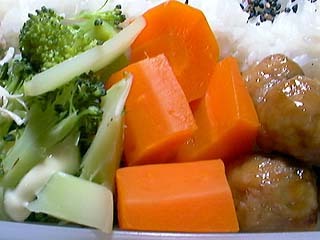 Place the carrot into the washed rice in the rice cooker. The quantities of rice and carrot depend on how many servings you want. Since Atsushi (a senior in highschool) is away from home for the entrance examination this week, I cooked two "go" (0.36 litres) of rice instead of the usual amount of four "go" (0.72 litres). I sometimes feel strange cooking such a small amount of rice. The dish will be ready in the morning, when the rice cooker is done. Simply remove the carrot-foil package from the cooker. Remove the carrot and cut it into pieces. It will be so tender that the knife will sink in with ease, but still firm enough to cut the carrot into squares. It will have a vivid red colour and be very tasty. This is a very simple recipe, but the only problem is that it can not be done at the last minute. I wish I had at least ten recipes like this one!